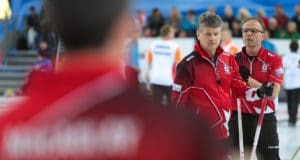 Thursday evening he got a whole dish of it, courtesy of provincial counterparts, Scott McDonald and Team Ontario (6-3, Kingston) who knocked Jacobs from the ranks of the unbeaten with a 7-6, extra-end victory. For the first time all week Jacobs and his teammates — third Ryan Fry, second E.J. Harnden, lead Ryan Harnden, alternate Lee Toner and coach Adam Kingsbury — couldn’t take advantage of the first-end hammer, giving up a steal of two followed by a steal of one in the second. McDonald, third Jonathan Beuk, second Wesley Forget, lead Scott Chadwick, alternate Jeff Grant and coach Sean Turriff, gave up single steals in the seventh and eighth ends and two in the 10th that forced the extra end. McDonald made a final rock draw for the win. Despite the loss Jacobs said his team is still in a good position to move into the weekend playoffs and even grab a spot in the Page 1-2 game. Moving forward still unbeaten is Kevin Koe and Team Alberta (9-0, Calgary) who survived a scare from Mike McEwen and Team Manitoba (4-5, West St. Paul) to score two in the 10th end for a hard-fought 6-5 win. 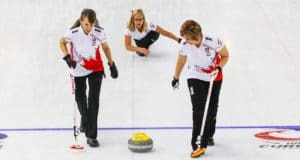 Koe, who won earlier in the day on another of his last-rock heroics, had an easier one against Manitoba, a delicate tap-back inside the four-foot. He got a lot of help in the eighth from Ben Hebert and Colton Flasch, who swept their arms off to carry Koe’s final stone to second shot to score two. 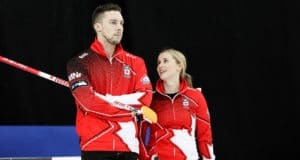 Two-time defending champion Brad Gushue and Team Canada (8-1) scored deuces in the seventh and ninth ends to beat Kirk Muyres and Team Saskatchewan (4-5, Saskatoon) 8-4, and Brendan Bottcher and Team Wild Card (7-2, Edmonton) continued their drive for a playoff berth with an 8-3 win over Jim Cotter and Team British Columbia (4-5, Vernon). There are two more draws Friday after which the top four teams — barring tiebreakers — will move into the Page Playoffs Saturday and Sunday. The 2019 Tim Hortons Brier continues with draw Friday at 2 p.m. and 7 p.m. (all times CST).